1972 Pontiac GTOs. Lot 39 of 49. CLICK-> The rear quarter is a typical place for rust on all cars. This one had a patch which is again rusted through. CLICK-> The body is separated from the frame. CLICK-> These guys are taking the frame off to be stripped and painted. CLICK-> That frame looks nice! CLICK-> The rear end gets bolted in. CLICK-> Very clean. You are going to need some oil in that nice clean rear. CLICK-> The front end suspension gets assembled. Disc brakes up front! CLICK-> Another shot of the front suspension. You can see that the engine is also being fit before paint. CLICK-> This red 1972 LeMans hardtop is owned by Chris from Canada. He has owned this car for 20 years. He got it from my brother in law. It was painted 19 years ago. CLICK-> Red 1972 LeMans hardtop, left side view. The car looks like it could fly. CLICK-> Red 1972 LeMans hardtop, left rear view. CLICK-> It's got a 402 Chevy engine under the hood. CLICK-> Wilderness Green 1972 LeMans hardtop with the Endura nose option. It is owned by Shawn Baird from Minnesota. It has the factory YS motor with 7K3 heads, Turbo 400 automatic, 3.55 gears, Rally II wheels, Formula steering wheel, AM/FM radio, a rear decklid spoiler (not on), and a console. Shawn, "It has 55,000 miles and has never been apart. It was just cleaned up and detailed." 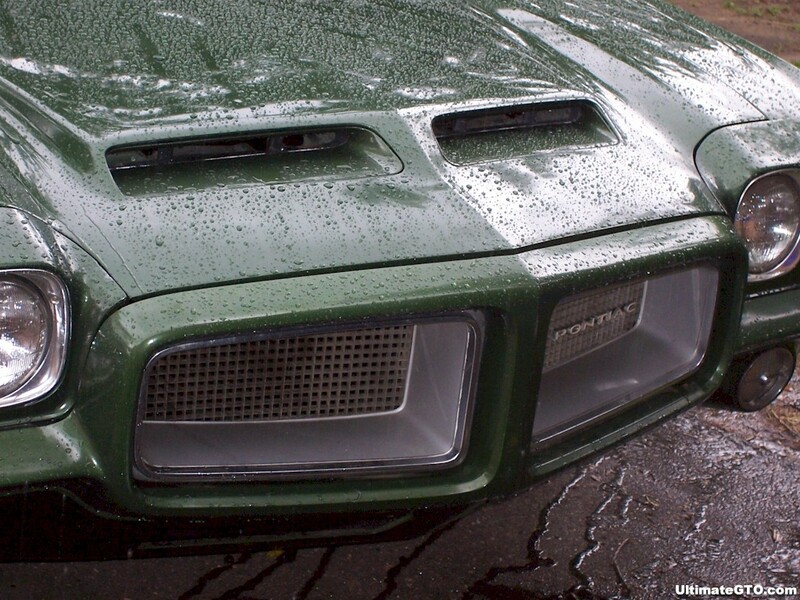 CLICK-> Close-up wet view of Shawn's Wilderness Green 1972 LeMans hardtop. This image would make a great 600-800 size wallpaper for your computer. How about a 1024-768 wallpaper version. CLICK-> Wilderness Green 1972 LeMans engine. Says Joe in Detroit - "It would be nice to run across more webpages like yours, as thorough and packed full of cool pix and info."